OK, I’m not sure exactly how “old school” this lemonade method is, but when I made some this weekend, my mother told me “This is how I remember lemonade USED to taste!” REALLY good stuff. 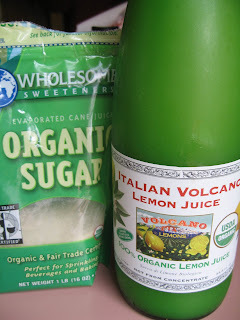 I used organic lemon juice that I bought at Costco. It's a huge bottle, so what to do? If you’d like to make old school lemonade by the glass, try this lemonade recipe. If you’d like to make it by the pitcher, try this other lemonade recipe. The simple sugar syrup is easy to make - just water and sugar on the stove (see the above recipes for tips). Here's a picture of it boiling. Stir constantly to make sure you don't burn it! Keep the sugar syrup in the fridge until the next time you make a glass. OK - tell me. Does lemonade go with brownies? I think it does. Some disagree. I'm *this close* to making an Alton Brown brownie recipe to go with this lemonade. I just realized - the previous statement sounds like a threat. Yummm...The perfect post. I love lemonade and brownies. Of course they go together!